It’s that time of year when we all breathe a little sigh of relief, knowing that summer is here. Or do we? I do tend to breathe a bit easier, but that could be out of excitement too. Spring and early summer is the time of year when I start to plan my next homeschool year. I love all the planning of it, from picking curriculum to watching sales for school supplies, to creating schedules. I figured if I love having printables to organize my homeschool, maybe you do too…so for the next 10 days, I’m going to be sharing a free printable each day with you that I use in my home! Some of these will be for organizing your life at home and some will be specific to your homeschool. Come back each day, and take your pick as to which printables you will find helpful when planning and organizing a new year, or get them all sent you via email! 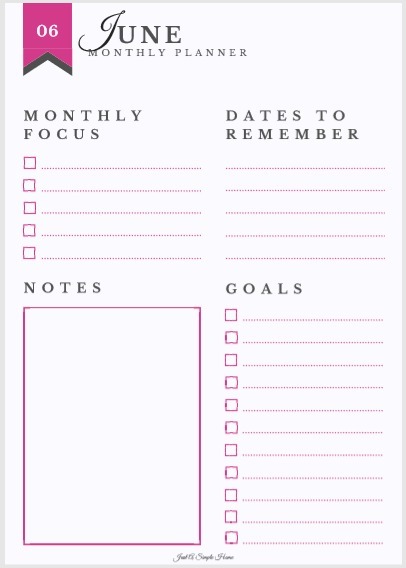 Along with monthly calendars, I like to have a monthly focus printable, where I can record my goals and priorities for the upcoming month. I also have a place to record any dates I need to be aware of that month, and a place for notes. I find having this page right next to my monthly calendar in my planner helps me stay more focused throughout the month. I can also revisit the previous month when I am setting my focus and goals for the following month. 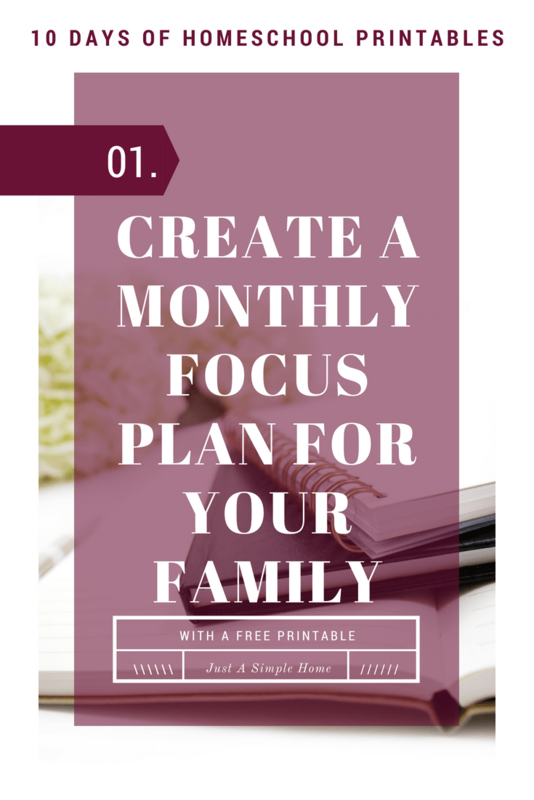 I’m giving you all 12 months of this Monthly Focus Printable! You can use this in your homeschool or in any area you need more focus in your life. I hope it helps you as it does me! Download your monthly focus sheet instantly when you join our homeschool newsletter. Please check you inbox to confirm you want to join our community! You can look forward to more free printables, tips to help you in your homeschool journey and a free community for support. This post is part of a 10 Day Series of Free Homeschool Printables. Click the button below to see all the posts and get your free printables! 4th Of July Copywork Pack || Limited Time Freebie! That’s such a cute planner! I’m going to homeschool preschool since I just became a SAHM. Organization is a challenge for me! lol I’ll have to grab that planner! What a great resource to help busy mamas stay organized in their homeschooling endeavors! The colors on the printable are super cute, and the categories are nice for planning. I signed up for all the printables! This monthly focus would definitely help me stay more on top of things.